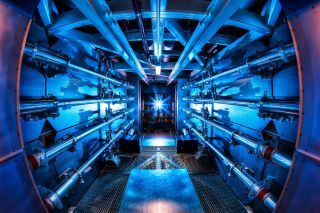 The National Ignition Facility set a record of laser shots on July 5 by delivering 1,000 times more power than what the U.S. uses. A U.S. fusion lab has made a record-shattering laser shot that focused a cluster of lasers on a single target like a mini Death Star. The new record for the highest-power laser shot paves the way for the lab's efforts to create sustainable fusion energy, similar to what takes place in the fiery heart of stars. The National Ignition Facility (NIF) delivered more than 500 trillion watts (terawatts or TW) of power during its historic test shot on July 5 — about 1,000 times more power than the entire United States uses at any given time. That power came from 1.85 megajoules of energy that represent about 100 times as much as what any other laser can sustain. "The 500 TW shot is an extraordinary accomplishment by the NIF Team, creating unprecedented conditions in the laboratory that hitherto only existed deep in stellar interiors," said Richard Petrasso, a physicist at the Massachusetts Institute of Technology. Each of the 192 lasers fired within a few trillionths of a second of each other at the Lawrence Livermore National Laboratory's National Ignition Facility (NIF) in California. They focused their power on a pea-size target, similar to a capsule that can hold the deuterium and tritium fuel needed for achieving fusion — the process that creates energy from the fusing of atoms. All that laser power is needed for the NIF's plans to try an approach known as inertial confinement fusion. The combined laser power would make the fuel capsule's outer layer explode outward and create an opposite reaction — according to Newton's third law — that would compress the remaining fuel enough to trigger a fusion reaction. The July 5 test that delivered the highest-powered laser shot ever represented the third of NIF's laser shots to focus more than 1.8 megajoules (MJ) of energy on the target. Scientists previously set the record for the highest-energy laser shot ever by delivering 1.89 MJ to the target with a peak power of 423 TW on July 3. "NIF is becoming everything scientists planned when it was conceived over two decades ago," said Edward Moses, director of NIF. "It is fully operational, and scientists are taking important steps toward achieving ignition and providing experimental access to user communities for national security, basic science and the quest for clean fusion energy." Post 9/11 airport security has caused comic levels of hassle for almost a decade, and shows no sign of letting up. But by using biometric sensors, special noninvasive scanners and a dose of common sense, the International Air Transport Association's (IATA) "Checkpoint of the Future" make flying the tolerable, dignified activity we all remember. "Today's checkpoint was designed four decades ago to stop hijackers carrying metal weapons. Since then, we have grafted on more complex procedures to meet emerging threats. We are more secure, but it is time to rethink everything. We need a process that responds to today's threat. It must amalgamate intelligence based on passenger information and new technology. That means moving from a system that looks for bad objects, to one that can find bad people," said Giovanni Bisignani, IATA's Director General and CEO. Three security lanes will have technology to check passengers according to risk. Each traveler will undergo an iris scan to determine their identity. A computer will then crosscheck each persons? travel history, and determine their relative risk based on a complex intelligence algorithm. "Known travelers" who have registered and completed background checks with government authorities will have expedited access. "Normal screening" would be for the majority of travelers. And those passengers for whom less information is available, who are randomly selected or who are deemed to be an "Elevated risk" would have an additional level of screening. In this scheme, your elderly grandmother would only need to pass through the standard metal detector, while a young man returning from a trip to Pakistan would go through a more extensive explosives check. Screening technology is being developed that will allow passengers to walk through the checkpoint without having to remove clothes or unpack their belongings. Moreover, it is envisioned that the security process could be combined with outbound customs and immigration procedures, further streamlining the passenger experience. "We have the ability to move to the biometric scanning and three-lane concept right now. And while some of the technology still needs to be developed, even by just re-purposing what we have today, we could see major changes in two or three years time," said Bisignani. This story was provided by InnovationNewsDaily, sister site to TechNewsDaily. Follow InnovationNewsDaily on Twitter @News_Innovation, or on Facebook.